The winter Milky Way over the Winter Star Party in February 2017 at Camp Wesumkee on Scout Key, Florida. Image credit: Brian Ventrudo. Behold a beautiful time-lapse retrospective of the 2017 Winter Star Party! 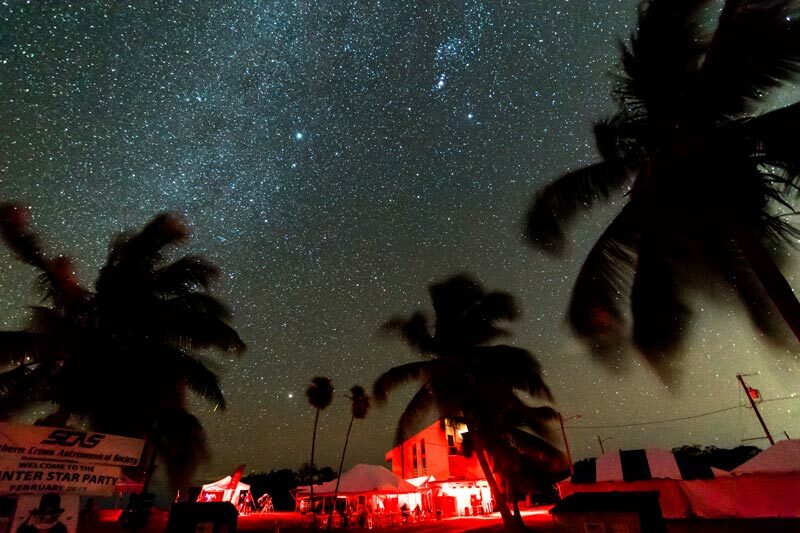 Ranked as one of the top ten star parties in the world by BBC's Sky at Night, the Winter Star Party was last held in the lower Florida Keys from February 20-26, 2017. Hundreds of serious amateur astronomers from all over the world assembled to see and image the heavens this wonderful seaside location. Dutch photographer and stargazer Bert van Dijk assembled his images into the fine time lapse video below. (Editor's Note: Check out the huge shark fin at 1:47. No one claimed this is a great place to go for a swim)! The Winter Star Party was established in 1984 by amateur astronomer Tippy D'Auria. It's hosted by Miami's Southern Cross Astronomical Society (SCAS) and held at Camp Wesumkee, a Girl Scout camp on the shores of Scout Key (formerly West Summerland Key). The good folks at SCAS planned the 2018 Winter Star Party for Camp Wesumkee on February 12-18, 2018. However, the camp was badly damaged, along with much of the lower Florida Keys, by Hurricane Irma, on September 10, 2017. The eye of the Category 4 storm passed just to the west of Scout Key. Video taken immediately after the storm showed severe damage along the highway through the Keys, and hardly a leaf was left on the trees outside the camp. SCAS announced they will relocate the 2018 Winter Star Party to the Chiefland Astronomy Village in northwestern Florida on the planned dates. You can learn more, and register for the event yourself, at the WSP home page at this link.